It’s starting to happen. I’m in the store, holding a product that I desire and I’m weighing a bunch of different considerations. Quality. Is this the product that I think it is? Does it look well made? Well-designed? Price. Is it worth the price? Is there a warranty, a rebate, a store return policy? Can I afford it? Ok, those are basics. I’ve been balancing budgets and looking for value for a long time. What about origin? Where is it made? For me, part of this is supporting Canadian industry but also I’m considering how far it had to travel to get to me. Pineapples have to come from a long way away. But honey, for instance, is easily obtainable from producers across Canada even though we import it from Australia! The free market “indicates” there is demand for that but the (unnecessary?) energy to get products to Canada or Yukon is starting to factor into some of my choices at the till. For many products, Canadian and provincial manufacturers exist and I’m taking some note of who makes what where. Some packaging can be re-used like pins, twist-ties, ribbons, and certain containers but there’s a limit to how well a household can absorb these. Fair trade. If products do come from far away countries (coffee, chocolate, spices, nuts, etc. ), does the supply chain include fair trade ethics of sustainability for the farmers? Organic/non-GMO/grass-fed/free-run – these all involve practices that sway away from industrialization of food production and they are starting to have a greater bearing on my product comparisons. Finally, packaging. Yep. It’s in there now. Not for every buying decision, but it is getting factored in more frequently. Of course, companies have a bona fide interest in protecting products to market and also preventing tampering. Nevertheless, enormous waste comes from unwrapping or opening products. Some packaging can be re-used like pins, twist-ties, ribbons, and certain containers but there’s a limit to how well a household can absorb these. The recent attention on single-use plastics like straws and plastic cutlery in the fast food industry is only the beginning. Packaging is a major single-use problem. It affects nearly every industry. 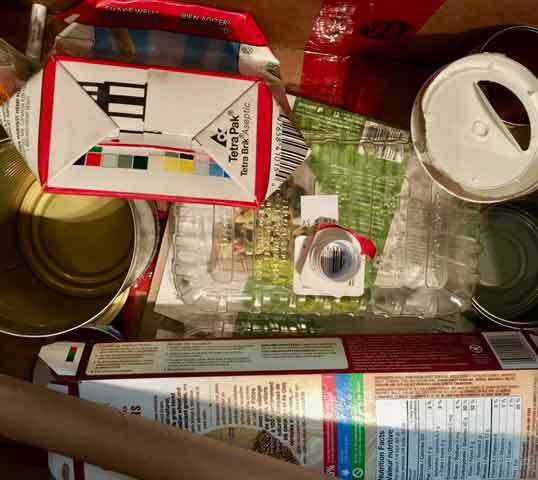 Plastics, boxboard, cardboard, Styrofoam, glue, cellophane, staples and screws, foil, paper, wood, tin, glass, aluminum, and other materials all end up in the unwanted department often shortly after opening products. For decades producers have used packaging to sell products and now the packaging is a part of the whole product. So, in the aisles, I’m considering whether I can cope with the materials. Are they reusable or recyclable? Can they be easily separated? Depending on my level of need, I might pass something over because of the packaging. Companies should try to figure out how to use fewer materials or make them easier to deal with at my end. That’s fair. When products advertise that they use 30% less packaging or some post-consumer waste or recycled materials or the plastic separates easily from the paper, – I’m paying attention. For decades producers have used packaging to sell products and now the packaging is a part of the whole product. I’ve seen people open products right after the cashier and leave the packaging in the store. If we take that route, let’s make it a respectful choice and not a protest because the store is not the producer. Though, I’ve seen some stores set up recycling bins right after the cash. That’s responsive! It’s not straightforward. Choices between packaging do not come without dithering. Take anything – a condiment for instance. All things being equal – that is, both products are desirable and affordable – should I get a plastic bottle or a glass bottle? Once they are both cleaned out, maybe there is a home re-use option for each container. Otherwise, the plastic will probably have a plastic lid and so the whole thing will be recyclable. The glass one will likely have a metal lid. That can go with metals. But the glass is a different conundrum. Glass is not recycled in Yukon. It is not shipped South, but is crushed and sent to the landfill. It is useful in the landfill for covering other waste and weighing things down. Unlike other materials with environmental downsides, glass is inert. Other than potentially being sharp, it is really not a problem for the environment. And the effort to make new glass out of old glass is greater than using raw materials (sand). So having it around is not an issue other than not wanting to have it around. Do you like how you access the condiment? Is one more re-useable because of its design/shape? It comes down to different values in different situations. Shopping involves choices. They didn’t used to be in the buying equation, but the materials in and around products are now a part of dollar decisions. I think more consumers are pondering design issues as well as how packaging will flow into the recycling chain.